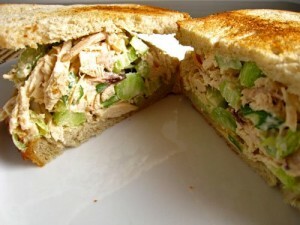 Chicken Sandwich recipe by Sobia Zulfi at DesiRecipes.com. Put mashed chicken in a bowl. Add mayonnaise and all the other ingredients. Spread the prepared mixture on the bread slice. Cut all the edges of sandwich and slice it into a trinagle shape. Its yummy i think....... bcaz i make similer recipe but add boil eggs that tooo yummmy .....so i think its also yummy!!!!! A MUST TRY!! VERY LIGHT, HEALTHY AND EASY.. MY BOY JUST LOVES IT :) THANK YOU SOBIA!! little bit of garlic should be added while boiling the chicken.